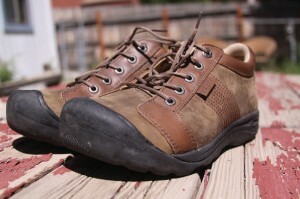 Over the winter, I received a pair of Keen Austin Pedal shoes to try out. Because of the endless rains we had this spring, I didn’t want to mess up these sharp looking commuter shoes. Finally, over the last few weeks, I’ve been able to give them a try. I’ve found them to be comfortable, with a nice stiff sole for easy power transfer to the pedal that doesn’t flex like a pair of running shoes does. They are stylish enough to wear at most social gatherings and with a cushioned sole, they are comfortable enough to wear all day. I wear custom insoles (Superfeet), and with the Keens, these are easy to swap out with the nice quality insole that comes stock, since it’s not glued to the shoe. The sole also comes with a removable plate so that one can install cleats for clipless pedals. I have not tried this feature out yet, but it appears to be well designed. The plate is easily replaced with two screws if one wants to switch back to platform pedals. Keens provide a larger toebox than other shoes. Since I am used to wearing narrower running shoes, I ended up needing a half size smaller shoe than I usually wear. All said, the Austin Pedals are a great choice for bike commuting footwear.